As enterprises look at opportunities for digital transformation in 2018, display technology and digital signage should be a big part of their thinking. While artificial intelligence, intelligent apps and blockchain might be the trending technologies in 2018, good old audiovisual (AV) has proved again and again to be a powerful way to streamline operations, spur collaboration and deliver innovative customer experiences. To cite just one example, our recent study with Forrester Research on the economic impact of outdoor digital menuboards in QSR found that conversion to digital signage provided a return on investment of more than 196 percent. Display technology has advanced rapidly in the past five years — with new solutions that are smart, connected, interactive and more immersive than ever before. Digital displays are our windows into the IoT, and the connection point between digital and brick-and-mortar. Looking at the new opportunities for innovation across multiple industries, the next several years promise to be a golden age for display and digital signage technology. On February 13, we kick off our eight-city Samsung Resolution Tour, a roadshow that will showcase the latest innovations in commercial display, workplace collaboration and digital signage technology. Enterprise customers will have the opportunity to gain insights to help plan their digital signage and workplace collaboration projects for 2018, with experts from Samsung and other industry speakers. Our product specialists and solutions engineers will be present to advise you on the right technology and deployment strategy for your organization. In addition, attendees will have the opportunity for a hands-on experience with the latest display products and solutions during the technology showcase. If you haven’t already signed up, you can register here. With the changing nature of workplace, businesses are increasingly looking for technology that can enable collaboration across geographically dispersed teams and encourage creative thinking. We’ll be showcasing our new Flip solution, a portable digital whiteboard that was created based on three years of market research, with the aim of better supporting small group collaboration. Conversely, our video conferencing solutions for huddle spaces, which we’ve developed in conjunction with HARMAN, address the needs of the growing remote workforce. 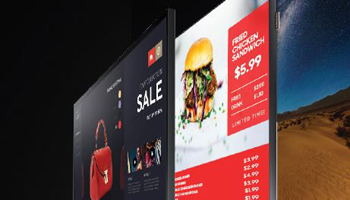 Digital signage was once confined to indoor environments, due to the significant engineering challenges of creating a display that could adequately compete with direct sunlight and weather conditions. The introduction of new high-bright LCD display solutions have now made it much easier and more affordable to deploy digital signage in outdoor and windowfront environments. Over the past 12 months, we’ve seen strong growth in outdoor deployments, and we’ll see this expanding further to other industries and use cases in 2018. While LCD is expanding outdoors, direct-view LED is coming inside with the advent of fine pixel pitch technology. New direct-view LED products with a pixel pitch of as little as 1.5mm can be used to create seamless videowalls that look stunning from a distance and up close. This is a premium technology segment that is generating a lot of excitement, with enterprises looking to leverage this new digital canvas to give a wow factor to their lobbies or other prominent locations. We’re excited to share our vision and help you put your business on display in 2018. To see the latest display technology and meet with the Samsung team, register to attend one of the eight Samsung Resolution Tour events.